I love when this happens…you start out making lunch from whatever needs to be used up in the fridge (and cupboard)…and then you suddenly find yourself getting inspired, adding a little more of this & a little of that until you have this rockin’ dish you never saw coming! That’s what happened last week when the dregs of a quinoa box, a few random stalks of kale, a can of tomatoes & some garbanzo beans met feta in a vibrant Greek-inspired salad I’ll definitely be making again and again. Prepare the quinoa as per instructions on the packaging. Set aside to cool while you prep the rest of the ingredients. 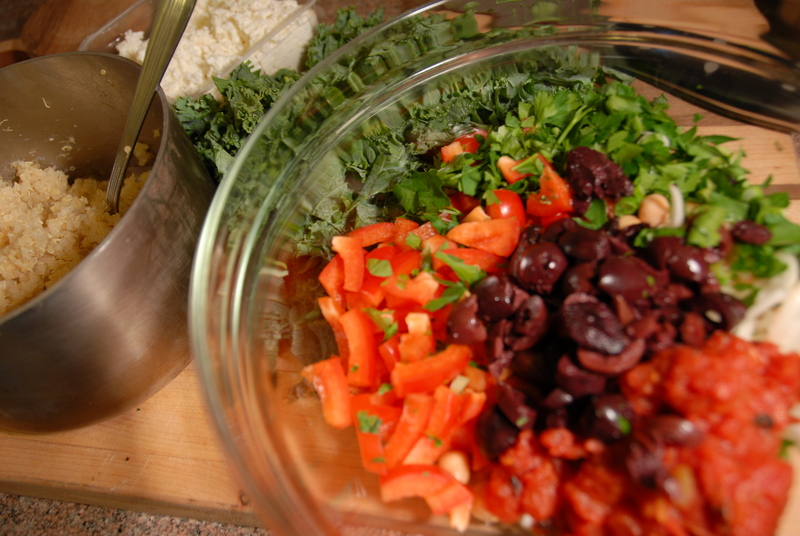 In a large bowl gather the rest of the ingredients: the chopped kale, diced peppers & olives, onion and scallion, parsley, garbanzo beans and drained tomatoes. In a small bowl place the oregano, oil & vinegar and a good dash of salt and pepper. Mix in the cooled quinoa and season with S&P. Whisk together the oil & vinegar and dress the salad. Incorporate the feta and enjoy – it’s so fresh and vibrant (not to mention filling with all that quinoa and garbanzos)! 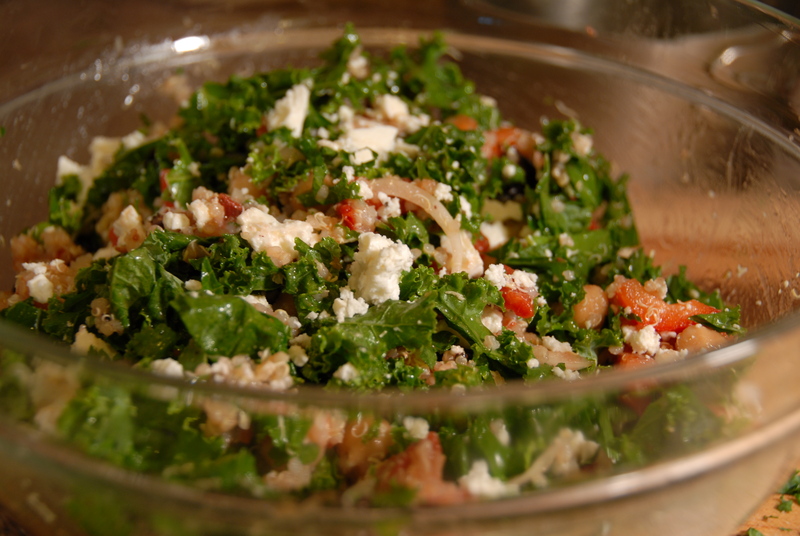 This entry was posted in Beans, Bell Peppers, Feta, Greens, Healthy, Kale, Onions, Quick & Easy, Quinoa, Tomatoes, Uncategorized and tagged feta, garbanzo bean, kale, onion, peppers, quinoa, salad, scallion, tomato. Bookmark the permalink.